This historical description does not do justice to the versatility of one of the most widely used construction materials, which provides countless opportunities for landscape design. Ubiquitous in paving, this tour is an ideal chance to learn more about its use in other built elements. 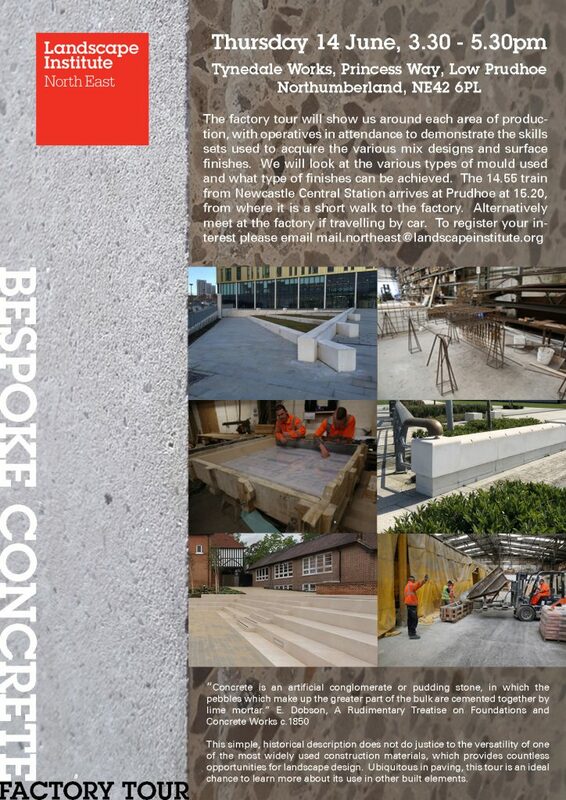 Bespoke Concrete’s products are installed at The Core building at Science Central in Newcastle as well as numerous other schemes in regional and nationally. The factory tour will show us around each area of production, with operatives in attendance to demonstrate the skills sets used to acquire the various mix designs and surface finishes. We will look at the various types of mould used and what type of finished can be achieved. Tea and biscuits will be included and it is quite possible we will decamp to a local pub afterwards. Register your interest at mail.northeast@landscapeinstitute.org and download a flyer here.